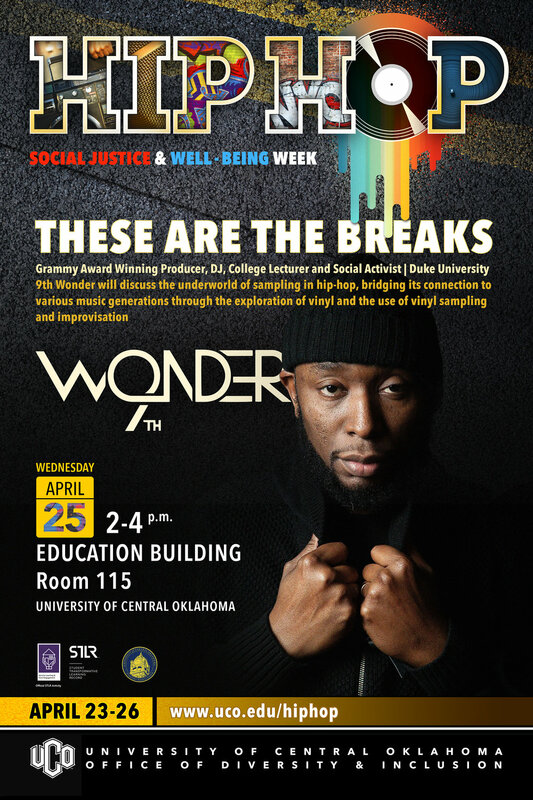 During this week April 25th, I will be judging a producer battle along side others and Grammy nominated Hip-Hop producer 9th Wonder. Please check out for the rest of the weeks lineup. Including a class using intersectionality to engage students in the work of fighting for visibility, inclusion, and justice and a Trap Yoga class. South by South West is one of the largest music, film, and tech festivals in the U.S. and every year I receive many inquiries as to how to get a SXSW showcase or “slot” to perform. I assume those wanting to perform have some bloated idea of how the festival may work and how a performance could work in their favor. I am not here to deter any artist from performing at the coveted festival, I’m just here to offer some leveled-headed expectations for a lot of artist all facing the same place in their music careers. I have created reasons why performing at a SXSW showcase may not be for you right now and reasons why you should still attend. This seems like a simple statement but I can break it down for you. SXSW being so large it's one of the only times I get see some of my friends from out of the country, it's the only time I can touch a bunch of people at once. On top of creating once a year moments, the festival is becoming less and less about discovering the artist and more about those that already have a bit of national press or attention. Sure, SXSW does a lot for an up and coming artist, but really ask yourself about the national notoriety you have or haven’t achieved. If you gain a stage to perform at, you will more than likely be fighting for attention with the artist with bigger “buzz” and better relationships with those in control. Attending SXSW is not cheap by any means with or without credentials. Travel and boarding just to attend SXSW can take a lot out of you, energy and financially wise, be smart about how much you are giving away. With the cost of everything it takes just to perform, you have to question if it's worth it. Some people rent venues or buy slots, on top of the cost of travel, this could easily set you back monetarily, just to say you did it. I have even been offered the chance to have my own showcases on the 6th street many times and quickly understood why things seem expensive and unfair. ROI is an important thing to pay attention to, to make sure you aren’t wasting your money. Every year at SXSW I make a daily itinerary, showing where I need to be, at what time and for what reason. 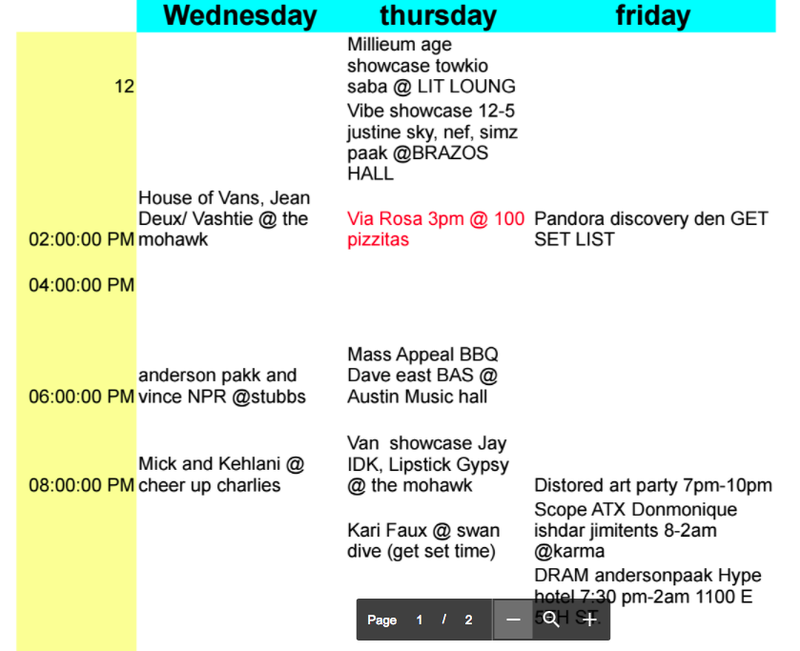 The schedule is because I can easily forget where I'm supposed to be and get lost in the abyss that is 6th st. at SXSW. During this week I use toiletries that I’ve packed with me, stay mindful of my water and food intake. There is too much going on at SXSW for people to remember to come to your showcase. I know a lot of people performing at empty bars at SXSW just to say they did it. I forget tons of concerts I planned to attend when people like Jcole, Daft punk, and Jesus decide to do a secret show during my friend's slots. Slot sellers get a very bad reputation at festivals like this and it’s not totally their faults. Prime real estate (on 6th st) at the festival is very expensive, and even if you feel like they are trying to scam you, they could just be breaking even, with the cost of the venue, sound, promotion and especially if they do not have a major sponsor. You could be on a bill with 20 other artists, most of these artists have not done proper promotion in ATX to benefit them and any bill with that many people will not run on time. These types of showcases sometimes have “surprise” performers making the show run long and unorganized. No soundcheck, tons of other musicians waiting to perform just hanging around are just a few things you can expect for paying for a lot of slots which could be more of a headache than it's worth. Relationships, Relationships, Relationships is totally the best way to not get taken advantage of. If you haven't built solid relationships with professional SXSW attendees you probably aren't ready to perform. At some point to must realize that most people look at artist, particularly rap artist with dollar signs on their heads. You “getting got” can always be shown in the form of “investing in your future” or some other shady phrase. If you can't tell the difference in people taking advantage of you and those looking out for you, then you have more work to do. 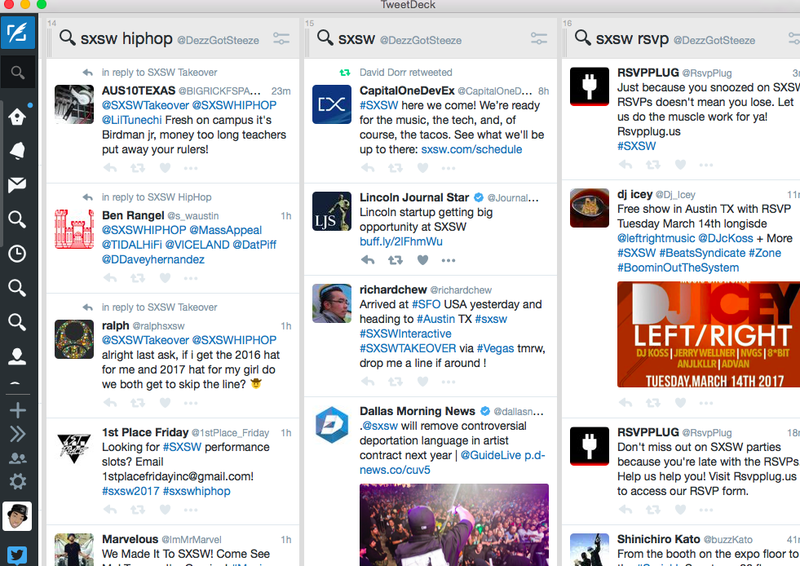 Look at who has OFFICIAL SXSW showcases or brands that you identify with, find them and spend time being present (since you have a whole week to do so). Are you sick of this phrase yet? Everyone who is someone will be there, writers, promoters, publicist, brand owners, touring agencies, managers, illustrators, DJs. One day you must wake up and figure out how present you want to be in the world to do what you need to do. This festival is a great time to figure that out. I personally already know who I plan to meet and I make it a goal to create conversations with as many like-minded people as possible, naturally of course. A music festival or an actual concert is the easiest way to find like-minded people since you already have music in common. In the Austin Convention Center (with credentials), you can attend panels on everything from the music business to startups finding new ways to combine tech and music. You can seek and find information, free food, giveaways, concert details and more in the convention center. I have attended panels and classes at festivals that were worth the price of the wristband I purchased. Check out SXSW list of guest speakers and keynote speakers, hang out in the lobby and bars areas, learn and be present. Earlier, I stated I attend to keep up with my friends out of the state/country. Them being present and my life and vice versa is important to me. SXSW is the time I use to catch-up with people meet their friends and vice versa. Most of all, SXSW is a great place for people to know about your brand and who you are. Get things to hand out and give them to those you had meaningful conversations with, follow them on social media, see them next year and continue to grow your brand and network. Austin has a great local music scene, it's so important to Austin that they even have programs for full-time musicians to obtain health insurance. 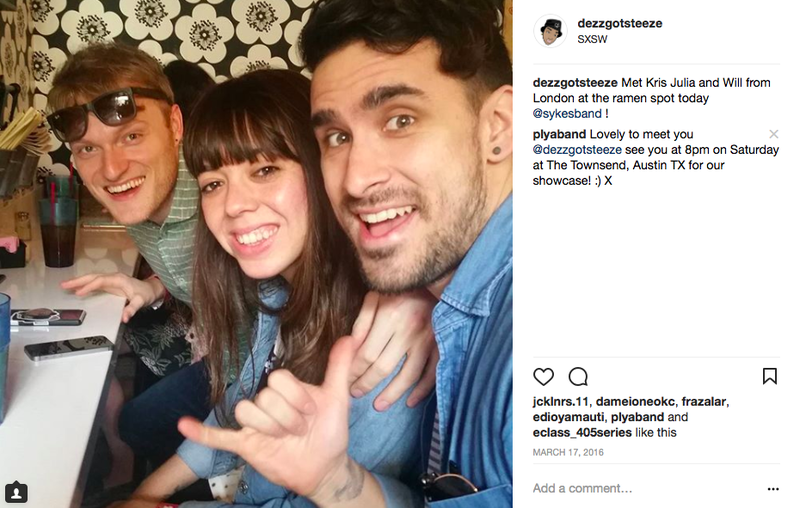 I would take the opportunity of being in Austin to mix and mingle with the local scene and maybe book things for future (non-SXSW) dates while there. Use your visit to create relationships for touring, press, influencers and more, make plans to bring your movement to ATX for a later date. Learning about the atmosphere of what Austin has to offer is a great way to spend your time at SXSW. Every opportunity is an opportunity to learn something. In Austin, you can learn about Austin culture, music opportunities, popular venues for future references, what being prepared means, so you can come back and do what you would like to do at the next SXSW. SXSW is a time be in the same room with very serious and professional people. Every year at SXSW you can learn about new ideas and trends in the music industry, this could give you a leg up on things you could use back at home or at your next SXSW. At SXSW a lot of people ask me about if wristbands or badges are needed to attend, and they aren't. 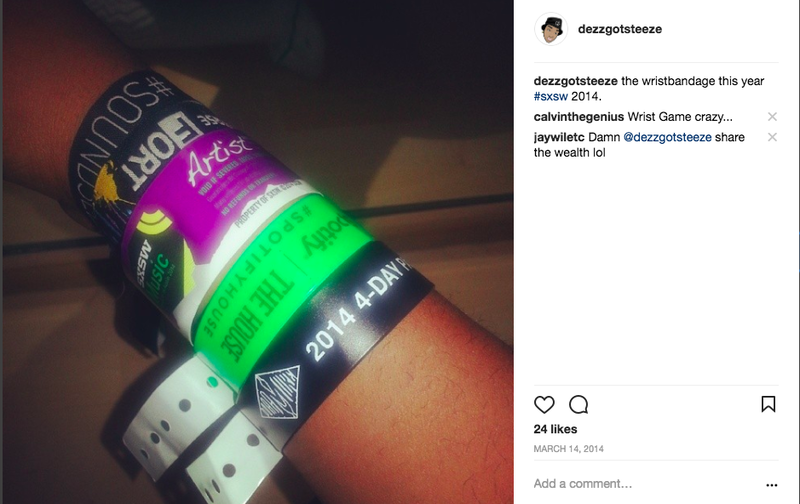 My very first SXSW I went without credentials, had a fine time and still attended many events. Hierarchy on who gets into events varies from event to event but most of them give priority based on this: Badges --> Wristbands (Artist, Press, Residential) --> nothing (you still may have to pay cover), with badges being a priority over everyone else. Entry always based on the capacity of the venue and badges are first inline and in the building, so please take note on this when deciding to attend. Some concerts will have higher attendance than others and some can be badge only. If you happen to find a showcase to perform at for free near 6th st. kudos, you may have found the SXSW holy grail or you have great relationships with people or/and great buzz. It looks like a few of my friends will be attending their first SXSW. I have decided to give you a list of things that have helped me have a successful week at the festival. SXSW is full of distractions you can spend a day in the Austin Convention Center getting free stuff or the whole week at random bars all over Austin and never see a single concert or film. Focus on why you are there or you may end up at a venue watching a group that looks like Millie Vanilli for 3 hours, because the place has outlets to charge your phones. See my itinerary below from last year. You will NEED a power bank for your phone. I would get one that has over 11,000 milliamps it should be able to charge your phone twice FULLY a day without help. Other items you will NEED: Water (or water bottle to refill), hand sanitizer, gum, earplugs (unless you want to lose your eardrums waiting for the next performer), flushable wipes (because bathrooms are not always pleasant), lotion, maybe a rain poncho, COMFORTABLE SHOES (that you can get dirty), a mirror and something to put this all in. If you haven't done that... shows may be slim for you. The next tip will help you with RSVPing. I have been to a ton of shows that were at capacity real fast so 3rd tier will be the first group to not be admitted at all to certain shows also, some concerts will make you pay cover for not having a badge or wristband. If you plan to attend in the future get an Email just for SXSW. Companies you RSVP to will use your emails to market throughout the year AND auto-RSVP you to next years events. SXSW is not for the faint of heart, unless you went there to chill. If you are like me and you want to see a bunch of stuff, pace your drinking and extra curricular activities because most concerts will start at 10:30AM and I have been to after parties/concerts at SX that were still going at 6am, THE NEXT DAY. SXSW with 3 people or less is optimal. It is very difficult to hit exclusive parties or even sit at bars with a large group. Larger groups also move slower than being solo and won't sway your intended SXSW experience. If you are an artist I would limit your music and marketing to those you had real conversations with. There are a lot of artists and industry people already at SXSW you would probably end up "preaching to the choir" AKA you can't make fans out of other rappers. SAVE YOUR MONEY. Even if you are not getting an official wristband/badge. you can still use the perks and information on the site. Information will include things like....Where do you find free transportation? Where to find free food? Where will official showcases for (insert favorite artist) be taking place? The free rides this year around SXSW will be provided by Mazda click the picture below for more information. I may seem like a Debbie downer in this post, but I want to keep you safe and informed. Email me for any questions.